With its tumultuous but fascinating history and exotic culture, Laos is a country that’s only become more open to mainstream tourism in the recent past. Technically called Laos PDR, the country was once the near-exclusive realm of tourists who were young and immortal, old and depraved, or just downright seedy. 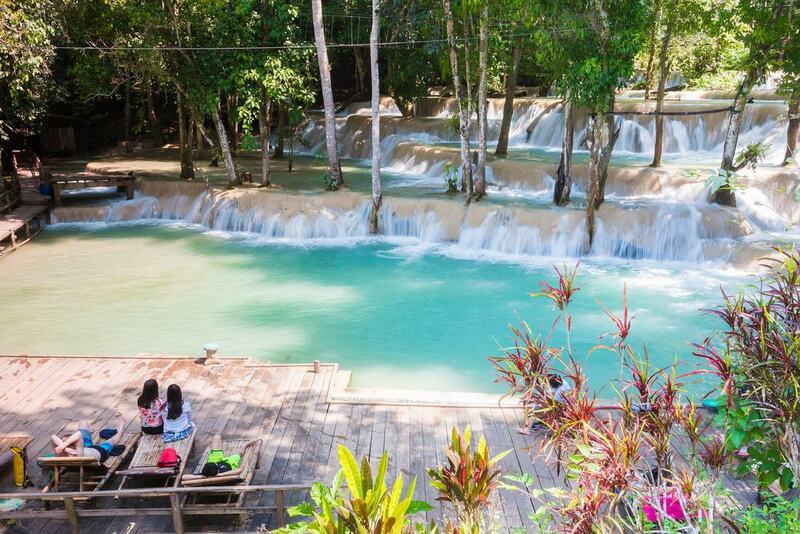 Now however, Laos is chock full of urban and rural tourist sites that are family-friendly. With its heavy annual rainfall and dramatic changes in elevation, the country is home to many amazing waterfalls too. 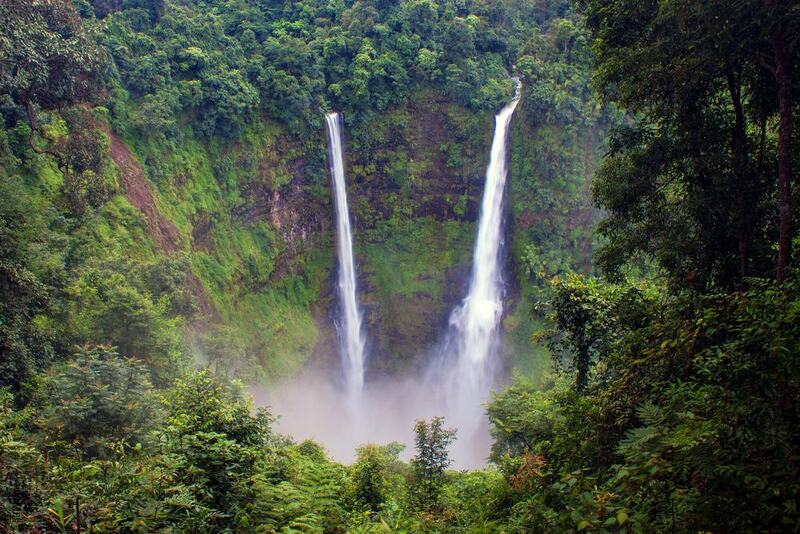 Below is a list of 15 amazing waterfalls in Laos. 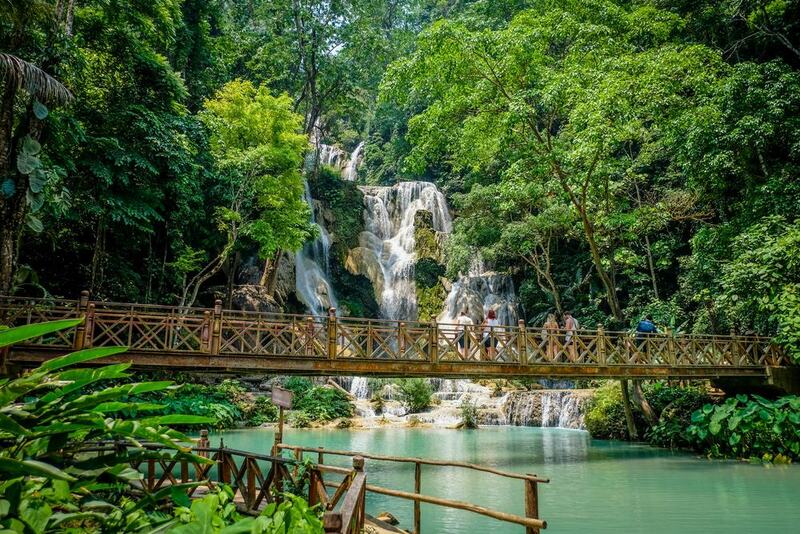 One of, if not the most popular waterfall in the country, Kuang Si Falls is located about 20 miles south of Luang Prabang. With a drop of nearly 200 feet, the fall is powerful and impressive, and a great place to reconnect with nature. Don’t worry if you forgot to get up early and pack tuna sandwiches and Fritos, because industrious locals have set up stalls selling all manner of tasty treats at the fall’s base, so you won’t go hungry. There’s also a bear rescue center nearby, if you’d like to get a good look at some local animals that have been saved and are being rehabilitated. As with many waterfalls the world over, Tad Sae was formed over eons as coursing water cut its way through the surrounding limestone, forming wonderfully aesthetic cascades and pools. Located near Luang Prabang, the fall is accessible enough to make it a favorite spot of locals and tourists looking to escape the hustle and bustle of everyday life. The fall dries to a trickle in the dry season, but during the rainy season, the inviting water is cool and refreshing. There are plenty of seating areas and chairs from which you’ll be able to relax and watch the fall in perfect harmony. 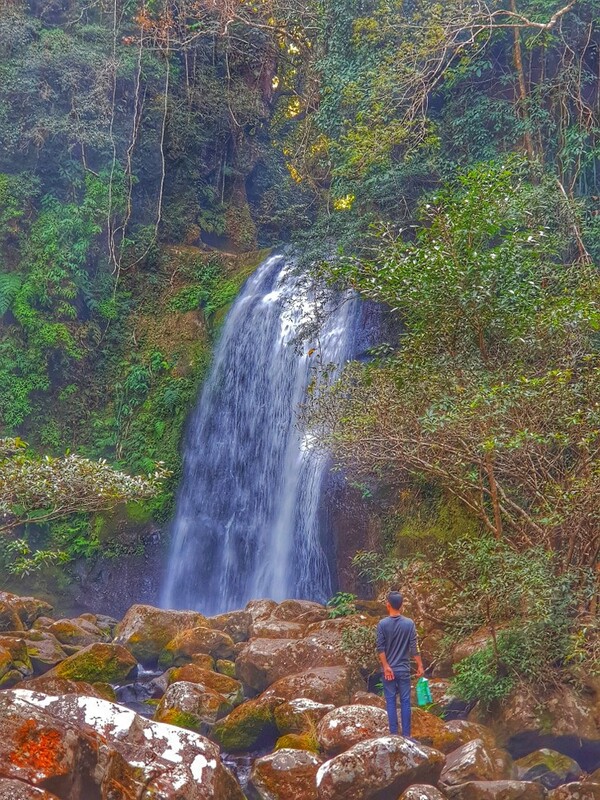 The Tad Fane Waterfall in Don Hua Sao National Protected Area in Champasak Province is a must-see if you happen to find yourself in southern Laos. At nearly 400 feet tall, the fall is majestic, and comprised of two watercourses that come together before flowing from the crest to the pool below. For those who’d rather not burn any calories or work up a sweat, it’s possible to view the fall from a moderately distant viewing area on the other side of the gorge. If you’d rather blaze a path to the top of the falls, try hiring a guide before you go. 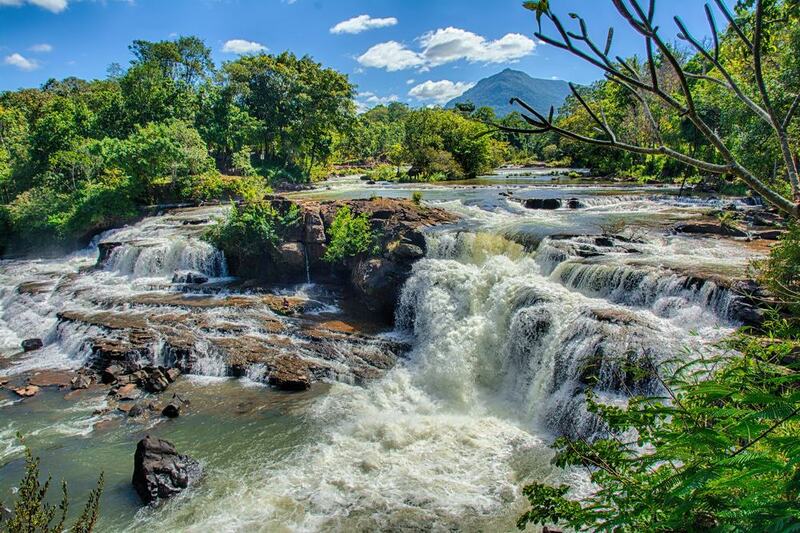 Located in Lao’s Champasak Province about 50 kilometers from Pakse, the park in which the Tad Yuang falls resides is a bit on the touristy side. On the other hand, it’s a great place to see a picturesque waterfall, and after you’ve had your fill of Mother Nature you’ll be able to stroll among the restaurants and vendor shops near the parking lot. 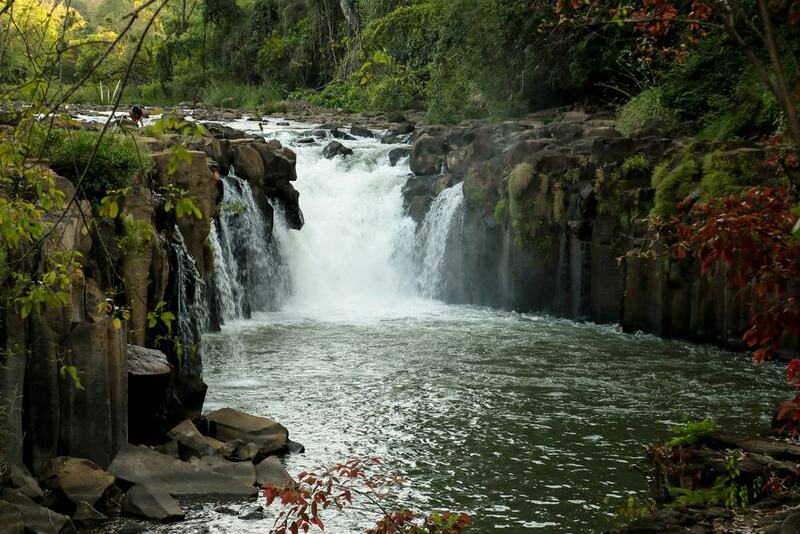 The water flow can be downright forceful in the rainy season, limiting swimming access, but if you happen to be there when the water is neither too abundant nor scarce, you’ll be able to swim above or below the falls. The object of much local lore, it’s believed that the rushing waters of Li Phi greedily collect the spirits of animals and people who didn’t lead virtuous lives. 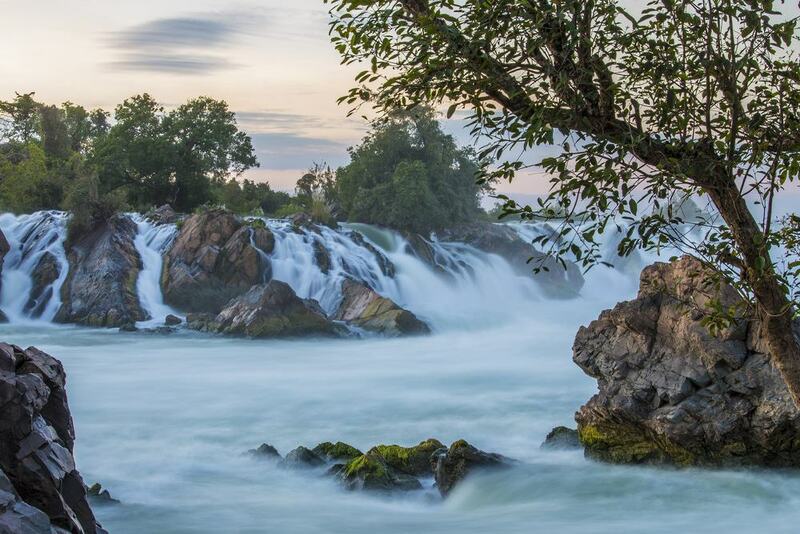 Located on the Mekong River, the fall’s swift water and slippery rocks can be treacherous. It’s located in the 4,000 Islands area of Lao’s southern border with Cambodia, and it’s possible to make trips into Cambodia from there if you’ve never been. Located in the 4,000 Islands region in the south of Laos, Khone Phapheng Waterfall is a natural wonder located on the Mekong River, which is the heart of many Southeast Asian countries like Laos and Cambodia. By volume, the fall is the largest in the region, and is the primary reason that it’s impossible to reach China via the Mekong. The highest of the fall is nearly 70 feet high, and unleashes a powerful torrent of whitewater, especially in the rainy season. 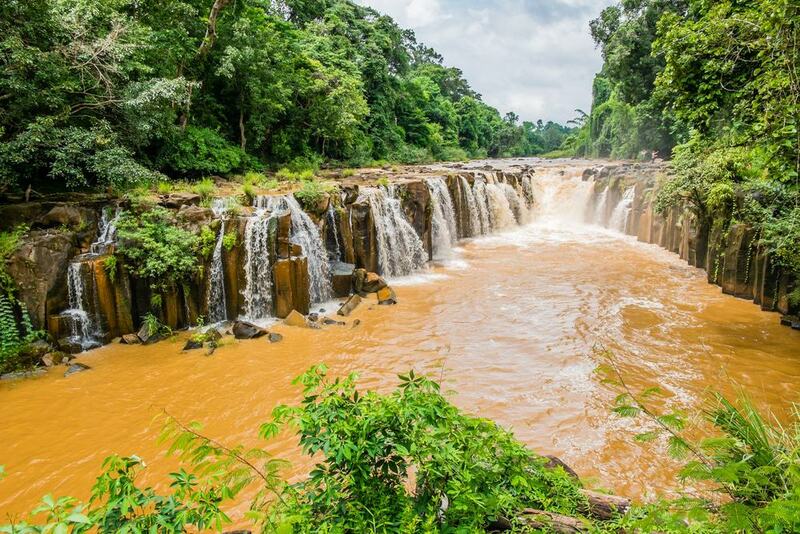 Located just outside the borders of the Nam Ha National Bio-Diversity Reserve in Laos’ Xiangkhouang Province, Nam Kat Waterfall is about an hour drive from the town of Oudom Xai in the country’s north-central region. It’s best to hire a guide in town, and make sure you have a good night’s sleep and nutritious breakfast before you go, because the hike to the falls and back will take a few hours at least. You may have the falls all to yourself, and although it isn’t large as far as waterfalls go, it seems to blossom from the surrounding forest. 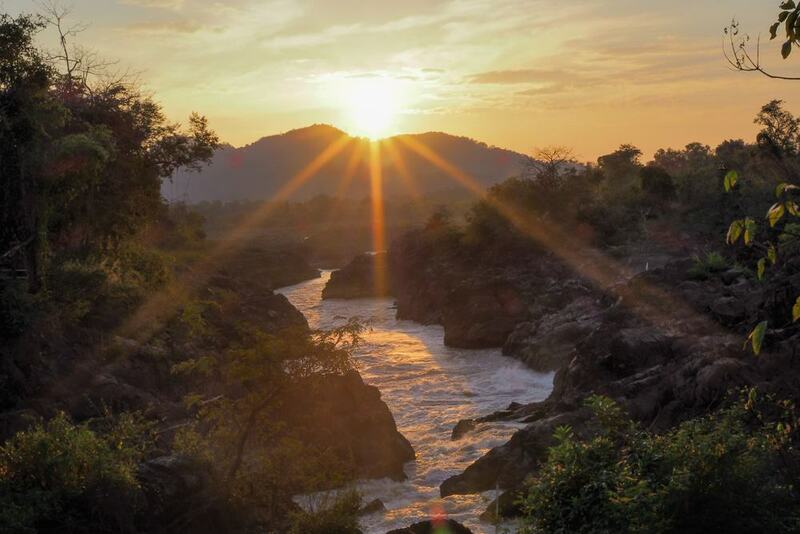 If feeling the wind through your hair as you roar through a foreign and exotic country on a rented motorcycle sounds like your cup of tea, then a trip to Tad Tayicsua in Laos’ Champasak Province might be just what the doctor ordered. Due to its remoteness and the difficulty of getting to it, it’s off the radar of most tourists, so if you’re inclined put in the effort, your reward will be a magnificent falls that may seem like your own private park. The hike down to the base of the falls requires a decent pair of shoes and can be steep and slick. Also in Champasak Province, the Nam Tok Katamtok falls is a relatively easy drive from the town of Paksong, making it an alluring day-trip option for those staying in the area. 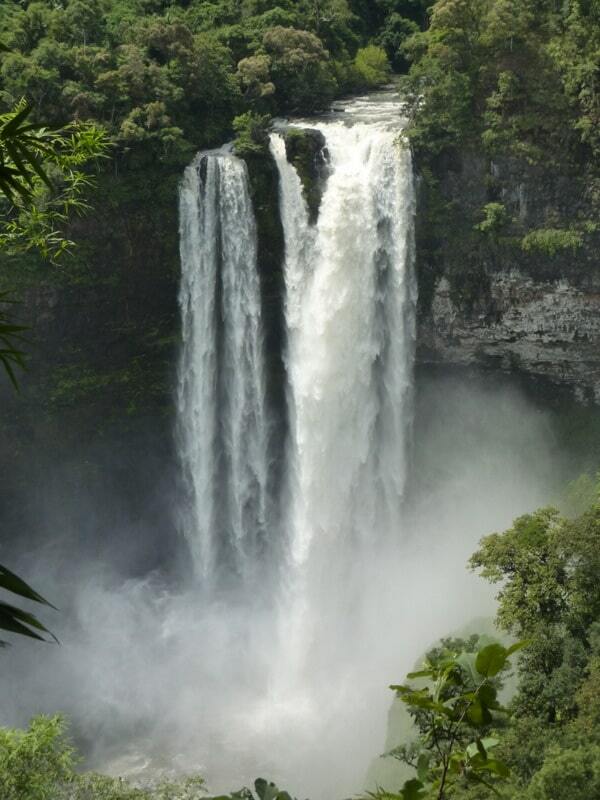 At more than 300 feet tall, the falls is one of the largest in the area, and located on the Huay Katam River in Lao’s Bolaven Plateau region, which is famous for its highland ecosystem and plentiful coffee plantations. The falls is only a short hike from the road, and its sheer size is more reminiscent of waterfalls you’d expect to find in Africa. 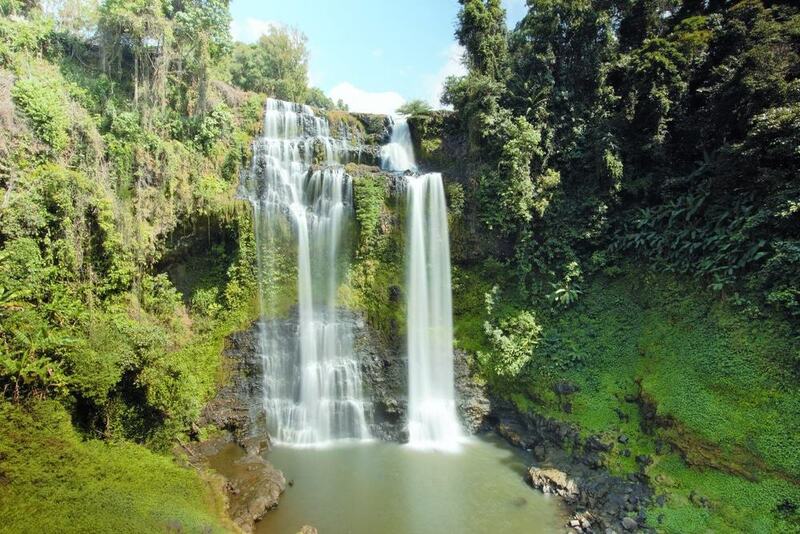 Named after the village of the same name nearby, the Tad Lo Waterfall is about 85 kilometers from Pakse in Lao’s Bolaven Plateau region. The fall is comprised of 3 distinct tiers: Tad Hang, Tad Lo and Tad Suong. The cataracts are particularly forceful and dangerous during the rainy months, and the area is known for its elephant tours, which will certainly be an adventure you’ll never forget. It’s possible to make a day trip from Pakse, or if you’d like to take your time at the falls and not worry about getting back, there’s ample lodging in the area. Located in Laos’ south in the region surrounded by Vietnam and Thailand to the east and west respectively, and Cambodia to the south, the Tad Somphamit Waterfalls is a wonderful place to stop when transitioning from one country to another in this region with so many exotic choices. There’s a small fee to enter the park, and during the rainy season, there’s a lot to do besides gaze at the falls, such swimming in the swimming pool or trying your hand at ziplining. Though the park is open during the dry season, the falls and amenities aren’t too impressive then. If you’re staying on Det or other nearby islands, it’s about 7 kilometers to the falls. At about 35 kilometers from Pakse, Pha Suam Waterfall is closer than the aforementioned Tad Lo Waterfalls, making it an easy day trip from the town. Shaped like a U, the fall is distinct in that the water doesn’t dry up in the dry season, although the flow can be reduced significantly. 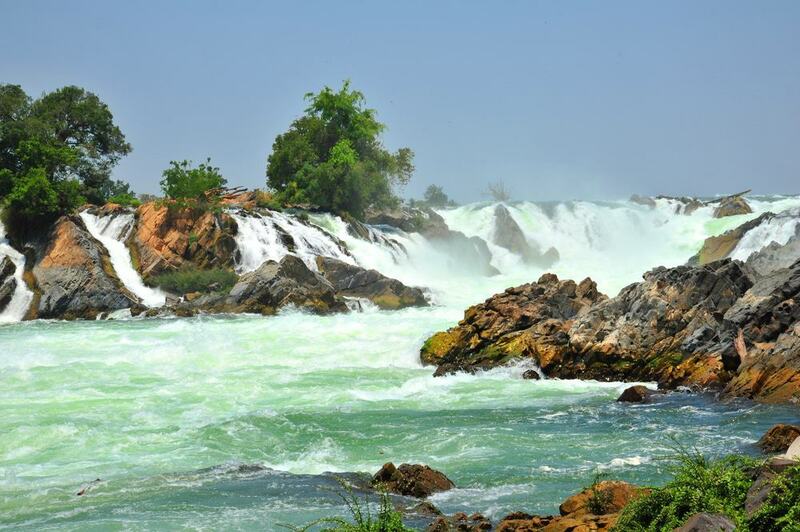 At about 20 feet high, the fall is on the Houai Champi River in Lao’s Salavanh Province. There are unique, treehouse-like bungalows available for rent near the falls if you’d like to take a night off from an air-conditioned hotel. Located in Nong Khiaw, 100 Waterfalls is one of the amazing waterfalls in Laos that you’re not likely to forget. As you may have guessed by the name, the area is home to countless waterfalls, and if you’d like to experience as many of them as possible, consider hiring a guide before you go. The guides usually save the largest fall for last. It’s the most majestic and resembles a temple, and if the water flow is just right you may be able to push through the mist at the fall’s base on a canoe made from bamboo. There are also a few bars and restaurants in the area with good food, and they’re great places to meet guides too. 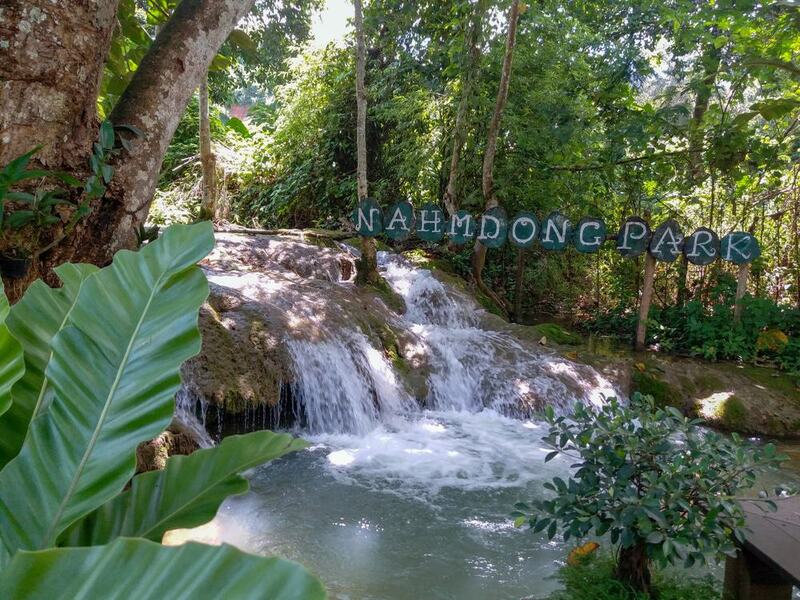 More resort-like than many of Laos’ waterfalls, the Nahm Dong falls and surrounding area are home to stunning natural beauty, architecture left over from the French Colonial days, and plenty of amazing things to see and do. The steps to the falls will get the old heart pumping, and there are different seating and swimming areas, some of which are suitable for families due to their shallowness and low flow. Other activities such as ziplining are available in the park, if you’d like to cram your day full of exhilarating activities. If not, find a quiet spot and spend the afternoon relaxing, reading or napping. Located in Ba Chiang, Tad Pha Suam Waterfall sports a rickety old bamboo bridge that seems to have been around since the beginning of time. Don’t worry though, bamboo is extraordinarily tough, and the bridge will give a great view of the falls. You may get some cool mist in your face too. If you’d rather play it safe, there’s a restaurant nearby from which you’ll get adequate views of the falls while sitting in relative comfort and safety. There are also villages near the falls that sell handicrafts made in the area, especially colorful sarongs.